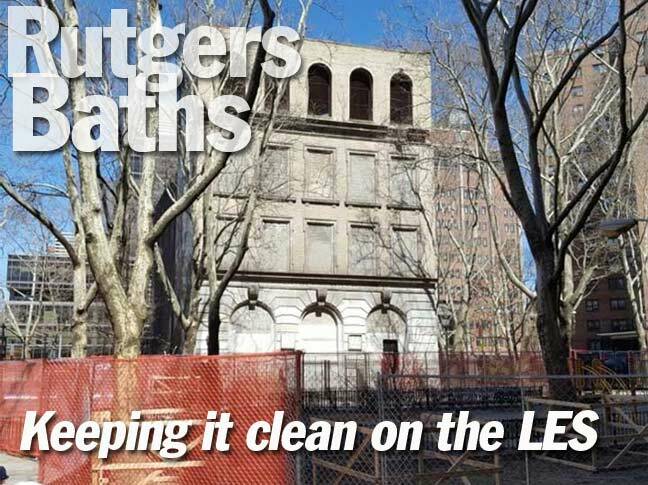 Having documented the abandoned Dr. Simon Baruch Public Bath as part of the page on East River Park, I went a mile to the south for the next nearest abandoned bathhouse, located on the grounds of LaGuardia Houses alongside Little Flower Playground on Madison Street at Jefferson Street. 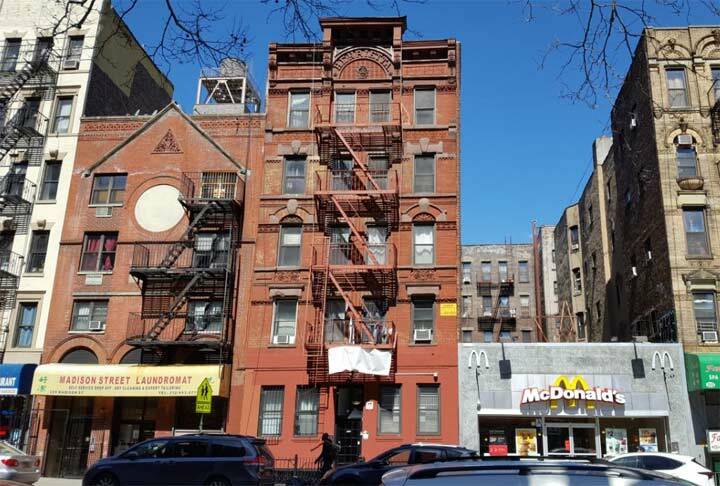 Like the Baruch Baths, this vacant building features a similar beaux arts design meant to attract and impress the immigrant population living on the Lower East Side. The 5 Rutgers Place Gymnasium opened on December 23, 1909, at a time when many of the surrounding tenements did not have their own bathtubs and showers. Public bathhouses were seen as a vital investment in combating diseases that were spreading in this densely packed neighborhood. In the 1940s the bathhouse was renovated to include an indoor pool and gym. 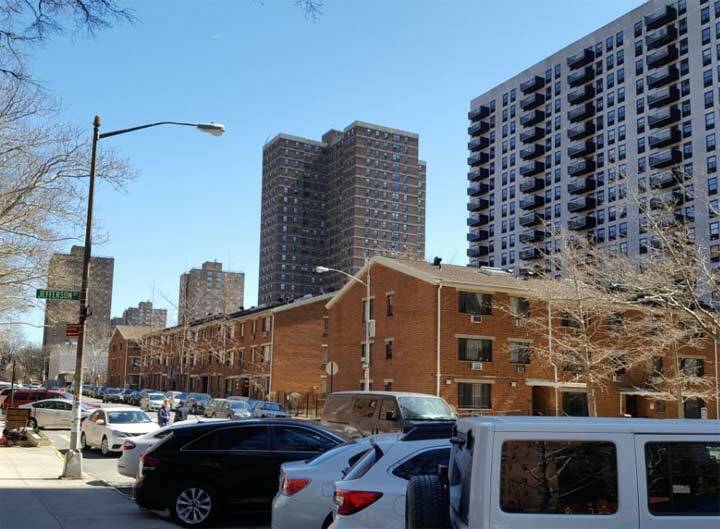 In 1957, the blocks bound by Cherry, Rutgers, Madison, and Montgomery Streets had all of their building demolished in favor of two public housing superblocks. The only building within this footprint that was spared was this bathhouse, whose front entrance faced a demapped portion of Rutgers Place. As was the case with Baruch Baths, this bathhouse also closed in the 1970s when the city was suffering financial hardship. 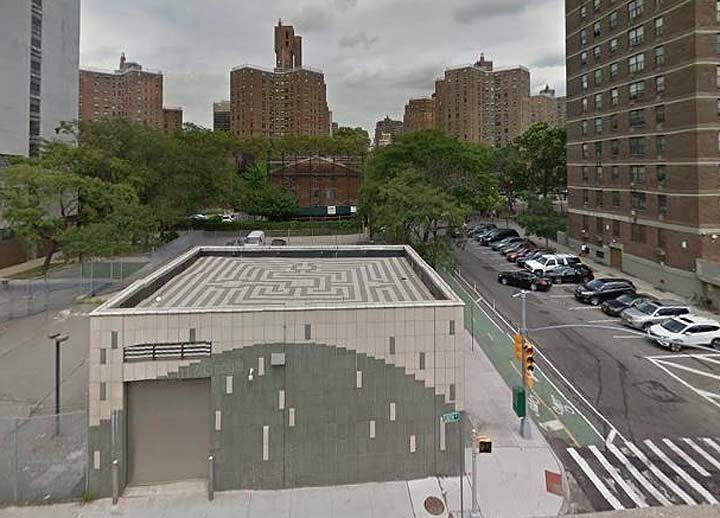 Aside from the building’s presence inside a NYCHA campus, its former address also makes it worthy of Forgotten-NY. 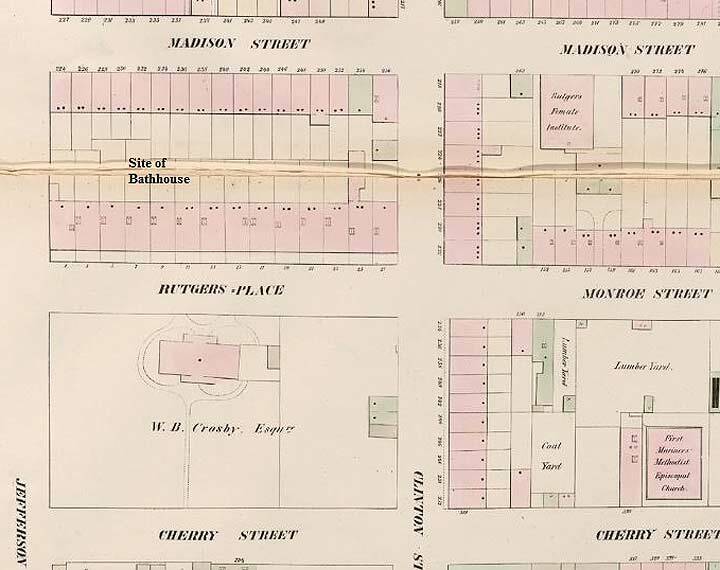 Rutgers Place was a designation given to a block of Monroe Street between Jefferson and Cherry Streets. What made this block special is that it had the last remnant of the once-sizable Rutgers farm, with the family mansion located on this block, across from where the bathhouse would be built. On the 1852 Perris map of the area, we see lumber and coal yards surrounding the mansion. When the Rutgers family bought their farm in 1725, it stretched from Catherine Street to Montgomery Street, with Division Street as its northern boundary. 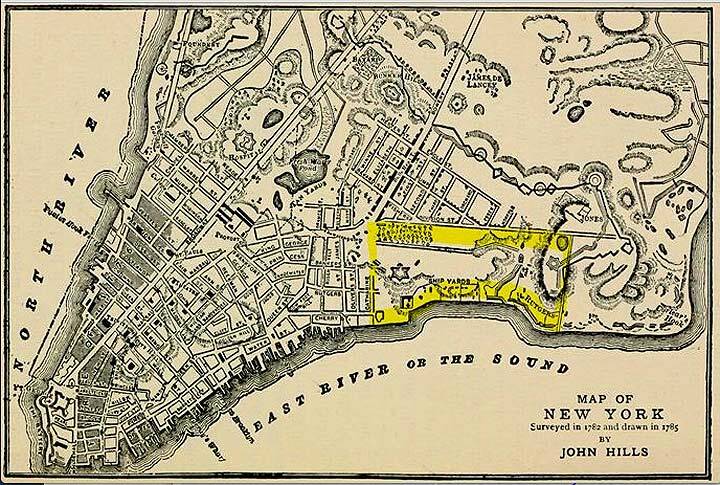 Division Street ran parallel to the East River shoreline and later roads laid between them became the neighborhood’s street grid. The most famous member of this Dutch colonial family was Henry Rutgers, the Revolutionary War veteran, politician, slave owner, and philanthropist whose legacy includes Rutgers University. A year after his death in 1830, his grand-nephew and mansion owner William Bedlow Crosby lobbied lawmakers at City Hall to rename a block of Monroe Street in honor of Rutgers. Crosby also appears on the city map with a street in SoHo. His mother Catherine was honored with nearby Catherine Slip. 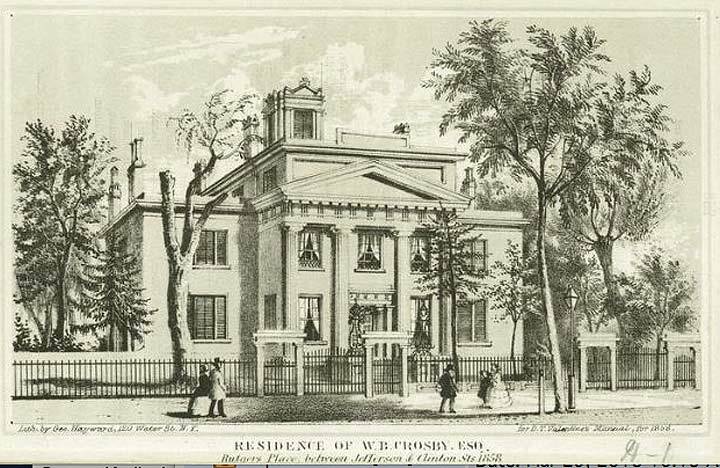 Crosby died in 1865 and the mansion stood until 1875, surrounded by lumber and coal yards, docks, and tenement apartments. None of his sons wanted to live here. By then all of the “old money” families had moved uptown. William Crosby was the last holdout. Aside from Rutgers Place, nearby Rutgers Street and the NYCHA Rutgers Houses keep the Rutgers name on the local landscape. In his urban renewal push, Robert Moses demapped dozens of streets in the neighborhood in favor of superblocks. Perhaps with second thoughts in mind, he had the residential towers and walkways built in a way that preserved the outlines of the former streets. Rutgers Place and much of Monroe Street can still be followed today by foot. Back in 2000, Kevin Walsh wrote an encyclopedic guide of streets on the Lower East Side that no longer exist as a result of urban renewal projects. Looking at old maps of the neighborhood, there are a couple of tiny streets that were left out. I circled them on the 1891 G. W. Bromley atlas of the area. All of them are open spaces, meaning they could be re-mapped if such a thing were to happen. Here’s their story. 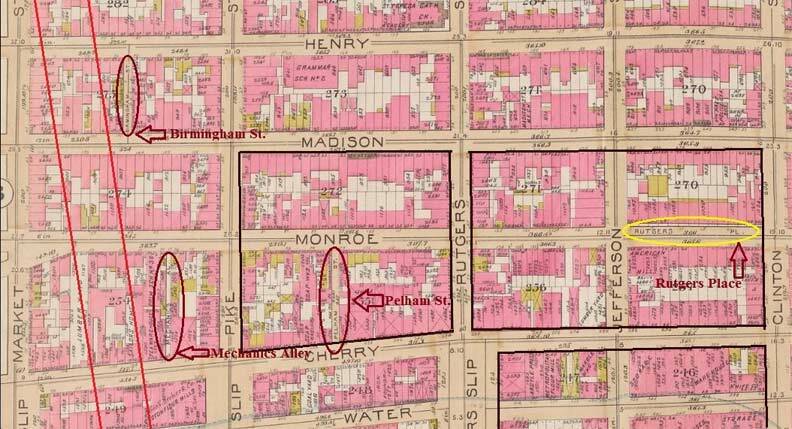 Pelham Street ran midblock between Cherry and Monroe Streets, which Kevin documented. Today it is an open area within the Rutgers houses superblock, part of the street’s footprint used for a parking area. 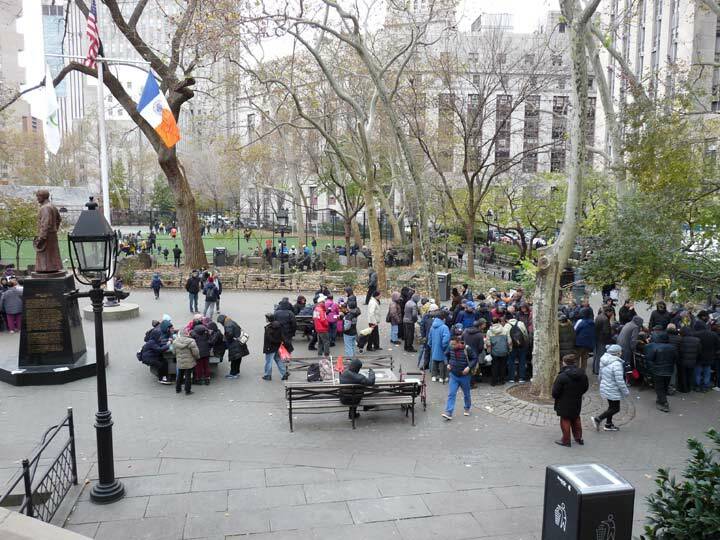 Mechanics Alley is today on the grounds of Coleman Square Playground beneath the massive stone anchorage of Manhattan Bridge. Birmingham Street ran between Madison and Henry Streets in the shadow of Manhattan Bridge. Today it is a parking area behind a DEP garage. Across the street from Little Flower Playground is a set of tenements that survived the urban renewal wrecking ball. Among them is 209 Madison Street, which has a Laundromat on its first floor. Notice its cemented rose window and the flower relief in a triangle above it. 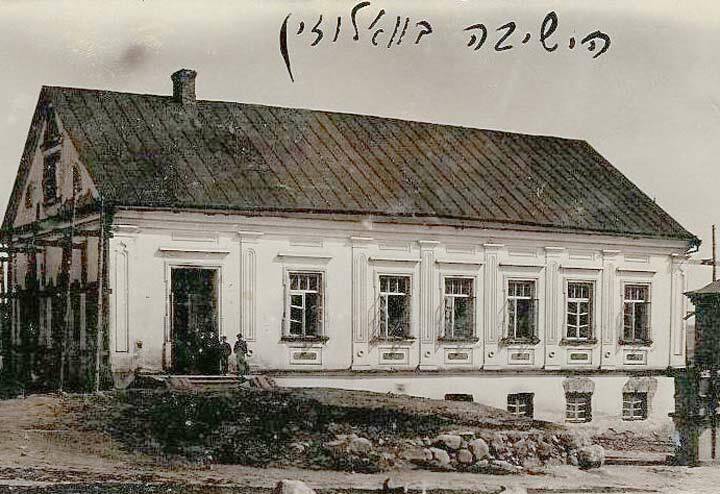 For much of the past century, this building was home to Congregation Eitz Chaim Anshei Volozhin, an Orthodox synagogue built by immigrants from the Belarusian town of Volozhin. 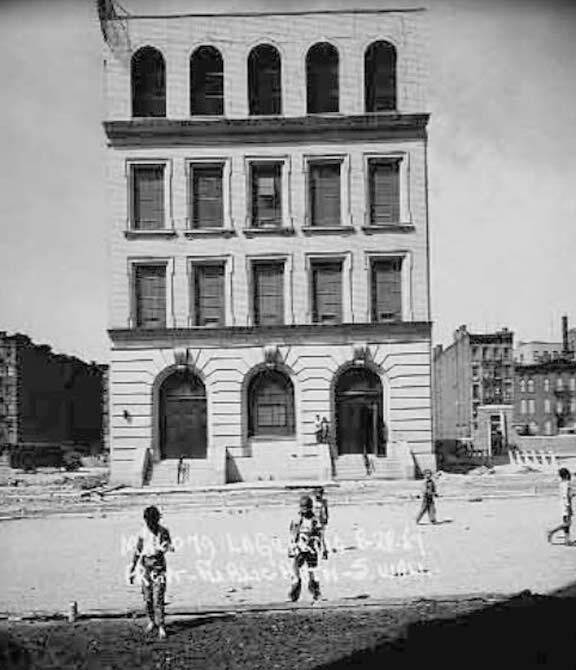 It was one of many small synagogues on the Lower East Side known as landsmen shuls where people from the same towns not only prayed together but also supported each other with benevolent funds and burial societies. 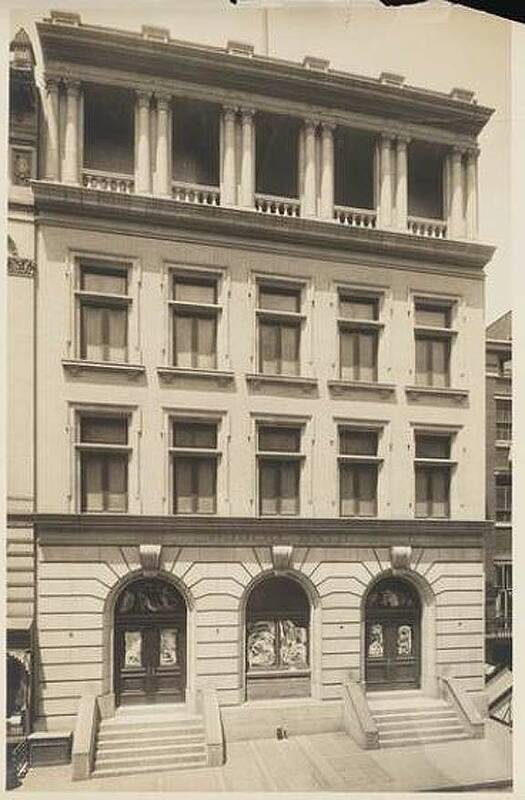 Among its founders was the Rudin family, who later made their wealth in city real estate. The synagogue was purchased in 1891 from a missionary society that had failed to convert the neighborhood’s Jews. The crucifix was removed and a star was installed in its place. An archival photo from 1978 from the MCNY collection shows its Star of David and stained glass windows. The tree motif and synagogue name is a tribute to the Etz Chaim (Tree of Life) yeshiva in its hometown. In turn the yeshiva’s name honors its founder Rabbi Chaim of Volozhin. 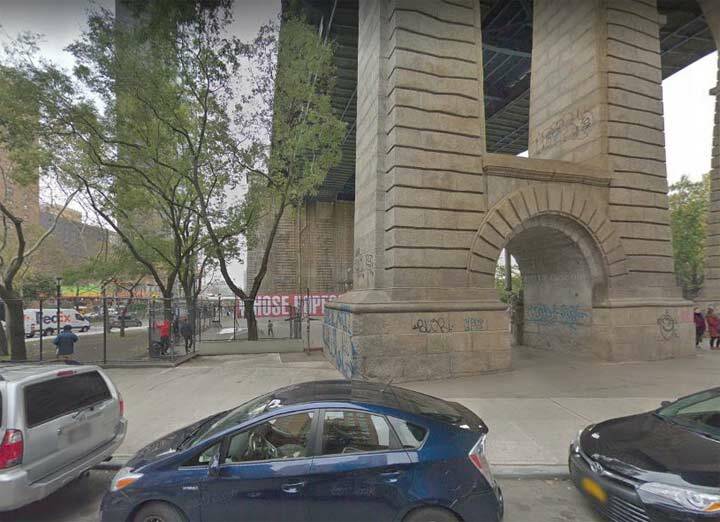 As the Jewish population of Lower East Side declined and children of Volozhiners either assimilated into the general population or the larger Jewish community, attendance dwindled. 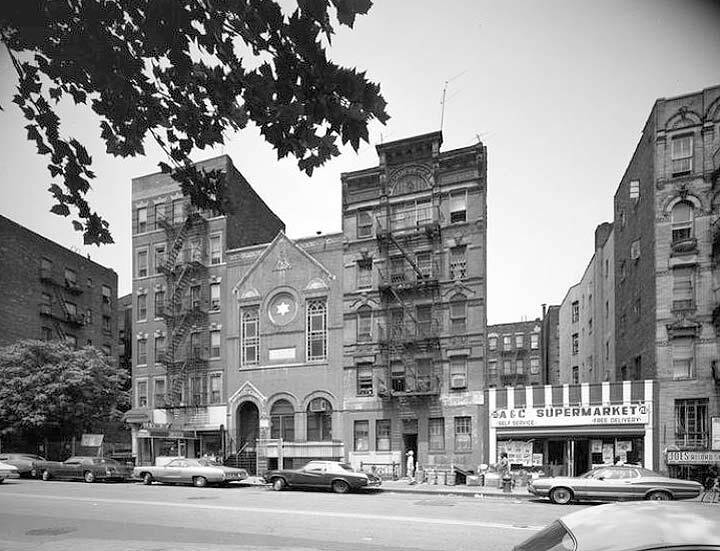 In 1991, the last trustees merged Anshei Volozhin with the Town and Village Synagogue on 14th Street and sold 209 Madison to a developer. It’s the only synagogue-turned-laundromat that I’ve seen. For more on the city’s former synagogues, speak to my fellow tour guide Ellen Levitt. 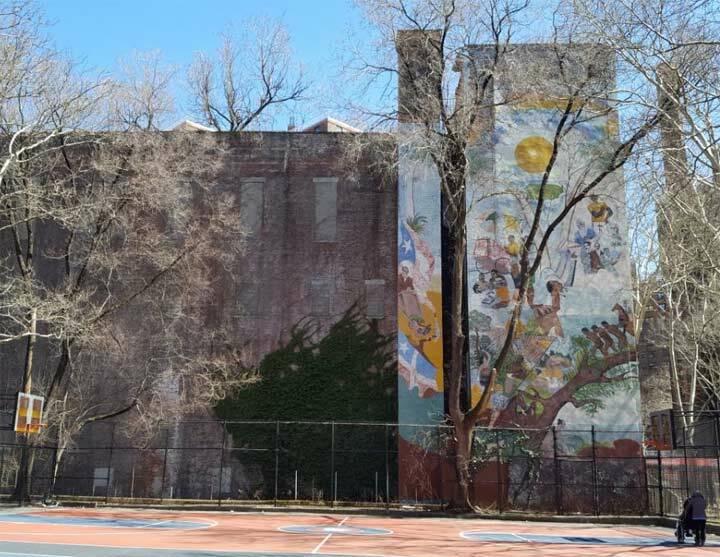 Another similarity between the Baruch Bathhouse and 5 Rutgers Place is the mural on the side wall. Following the Jewish wave of immigrants, the next large group to arrive on the Lower East Side were Puerto Ricans in the decades following the Second World War. With their history in mind, a mural was painted showing enslaved Africans, conquistadors, famous leaders, the Lares flag, and the official flag of Puerto Rico. The Puerto Rican influx was followed by the Chinese, and presently the neighborhood’s latest influx are gentrifiers settling into glass box condos that are replacing old tenements. Between Cherry Street and South Street parallel to the waterfront is a set of three-story dwellings that are unusual for this part of Manhattan. When they were built in the 1970s, nobody imagined that the city would experience a real estate revival. Planners envisioned modest homes for urban renewal sites, the best example being Charlotte Street in the Bronx where burned-out apartment buildings were replaced with suburban-style ranch houses. 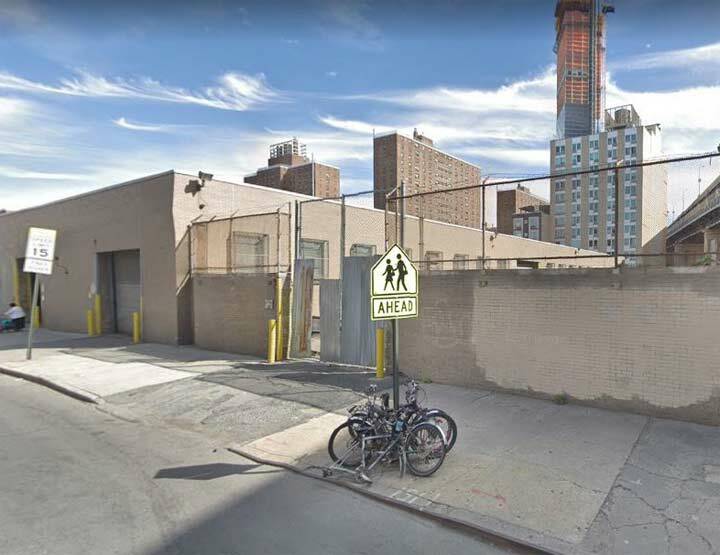 The Lower East Side is so hot these days that an 800-foot luxury tower now stands over the low-income housing projects, with more glass box towers expected to fill the parking lots on these blocks. 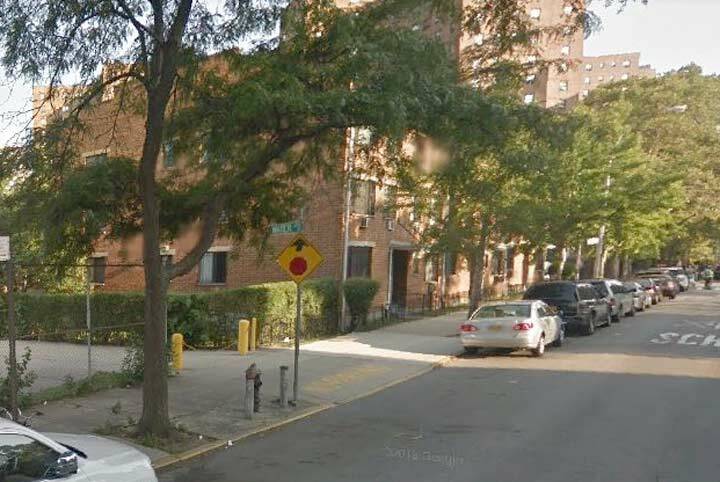 As it was with LaGuardia Houses, the superblock containing these small residences also preserve the routes of demapped streets, complete with official signs leading into driveways and parking lots. Also on this Clinton Street block is a cube-shaped unmarked DEP structure, containing a shaft leading into the water tunnels. Built in 2012, it features a wave design on its exterior walls, and for residents of the surrounding towers, a maze on the rooftop. Thanks goes to DEP architect Robert D. Cuevas. The only other rooftop art piece that I’ve known in lower Manhattan is the biplane atop 77 Water Street visible only to workers of adjacent office buildings. The former Rutgers plantation-farm has been transformed beyond recognition in nearly three centuries, but if you know where to look, there are hints of its former owners. 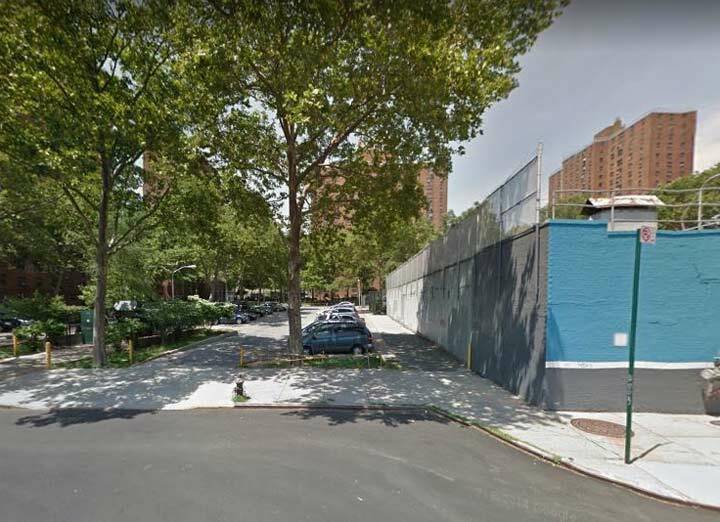 My connection to the neighborhood stems from my LaGuardia High School classmate Jonathan Foy, who grew up in Vladeck Houses. Together we explored the Lower East Side’s streets and building. This inspired him to go into architecture. We lost touch over the years and I could not find him on Facebook. Can anyone reconnect us? Update, 2/11/19: Plans were announced to demolish the bathhouse, which has been deemed unstable. I remember a Times article in the early 70s which told about the last bathhouse being closed down there. The attendants who worked there said that some patrons sang so loud in the shower ya could hear it throughout the entire building;sounded like Audition night at the Met. Wow I live on cherry st and the place is still there close down for years, it would be nice if they can do something with that building. I remember when i was the park keeper at Little Flower Park on Madison and Jefferson st playgroud back between 1979-80 and i was right next to the bath house with the mural on the wall some of your might remember me if u lived in that area near Cherry st back then and i always would look at the mural on the side wall of the bath house, no one wanted to save the building now its dued to be demolished around Feb 19, 2019 how sad, that bath house was a part of my past when i was working in the park 40 years ago this year wow how sad. The low rises were built in the ’80s, not the ’70s, and the reason was air right issues, a tower would have been too close to the 19 story apartment building with the balconies.